There are fears that the closure of one of the main routes in Northumberland after a lorry spilled its cargo could impact on local businesses. A section of the A696 will remain blocked to traffic for up to five days to allow for the removal of a 147ft (45m) wind turbine stem. Diversions have been put in place, with drivers warned to avoid the area. The landlord of a public house in nearby Otterburn said the closure meant there was now no passing trade. Clive Emmerson, who is also a parish councillor, said: “There’s no cars coming past, and in the summer months we rely on that a lot. Howard Snaith, owner of a local coach company, said: “We’re having to bring up coaches from other areas to meet up at the other side. 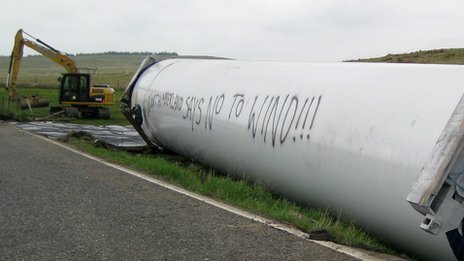 The 56-tonne structure was being transported to Green Rigg Wind Farm when it fell from its transporter on Monday, and graffiti was sprayed on it overnight. Two heavy cranes are being moved to the area to lift it on to a trailer, but before they can do so several tonnes of stone will have to be dumped on the boggy ground to make it safe for them. The road will also have to be repaired once it has been removed.